The 2014 midterm elections are a long way off but one thing is already fairly clear: Democrats face an uphill battle in trying to win back control of the House of Representatives. Thanks in part to their control of redistricting in a large number of key states, Republicans easily managed to hold on to their House majority in 2012. Despite losing the national House vote by well over a million votes, the GOP suffered a net loss of only eight seats in the House. So Republicans will go into the 2014 midterm election with 234 seats to 201 seats for the Democrats. This means that Democrats would need to pick up at least 17 seats to regain control of the House. In order to win back control of the House in 2014, Democrats would have to overcome one of the best known regularities in American politics — the tendency of the president’s party to lose House seats in midterm elections. Since World War II, that’s what has happened in 15 out of 17 midterm elections, including eight out of nine midterms under Republican presidents and seven out of eight midterms under Democratic presidents. In the nine midterms under Republican presidents, the GOP has lost an average of almost 21 House seats. Democrats have done even worse in the eight midterms under Democratic presidents, losing an average of almost 33 seats, including a postwar record 63 seats in the 2010 midterm election. There are several reasons why the president’s party almost always loses House seats in midterm elections. One is that opposition party voters are usually more motivated to turn out to express their discontent with the president and his party than voters from the president’s party are to turn out to express their support. In addition, House candidates from the president’s party no longer have the benefit of whatever coattails the winning presidential candidate had two years earlier. Finally, if the president’s party made substantial gains in the presidential election, they have to defend those seats, including some that may typically lean toward the opposition party, in the midterm election. Given the historical pattern of midterm losses by the president’s party, is there any reason for Democrats to be hopeful about the outlook for 2014? The answer, surprisingly, is yes. First of all, there have been two exceptions to the rule of midterm losses by the president’s party since World War II, and they were both fairly recent. In 1998, Democrats gained four seats in Bill Clinton’s second midterm election and in 2002 Republicans gained eight seats in George W. Bush’s first midterm election. So it is possible for the president’s party to overcome the midterm jinx. More importantly, the circumstances of the 2014 midterm election indicate that this could very well happen again: A statistical forecasting model based on three factors that accurately predict the outcomes of midterm elections indicates that Democrats have a chance to gain seats in the House. The midterm forecasting model predicts the change in Republican House seats based on three factors — the number of seats held by Republicans in the current House, the margin by which the Republican candidate won or lost the previous presidential election and the Republican margin in the generic ballot in early September. 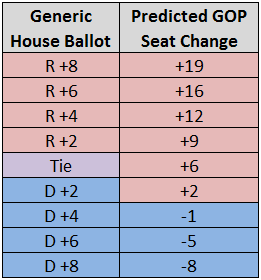 PCRHS = predicted change in Republican House seats, CRHS = current Republican House seats, PRPM = previous Republican presidential margin and RGBM = Republican generic ballot margin. The model was highly accurate in predicting Republican seat gains or losses. For the 17 midterm elections since World War II, it explained 94% of the variation in Republican seat change with a standard error of 9.8 seats. Moreover, two of the three predictors are already known for 2014: Republicans hold 234 seats in the current House and the Republican presidential candidate lost the 2012 presidential election by a margin of 4% of the major party vote. The only unknown is the generic ballot. We can therefore make conditional predictions of the change in Republican House seats depending on the results of the generic ballot in early September of 2014. Those predictions are presented in Table 1. The results displayed in Table 1 indicate that a Democratic margin of four points or more on the generic ballot would predict a net gain in House seats for Democrats. The most recent Pollster.com average shows a four-point Democratic lead on the generic ballot. That would predict a Democratic gain of one House seat in the midterm election. However, Democrats would need to pick up 17 seats in 2014 in order to regain control of the House and based on the midterm forecasting model, Democrats would need a margin of 13 points on the generic ballot in order to gain 17 House seats. The results of the midterm forecasting model indicate that while Democrats have a real chance to buck the normal pattern of midterm elections and gain seats in the House of Representatives, they are unlikely to pick up the 17 seats that they would need to regain control of the chamber. That outcome would require a wave election like 2006 or 2010. But the 2014 midterm election is unlikely to be a wave election. It is much more likely to be a status quo election for the House of Representatives with one party or the other making a small gain and Republicans holding onto their majority. The prediction of a status quo election is supported by the fact that neither party currently holds a substantial number of House seats in districts that lean toward the opposing party in presidential elections. Of the 201 seats currently held by Democrats, only nine appear to be in districts that were carried by Mitt Romney in 2012, and of the 234 seats currently held by Republicans, only 16 appear to be in districts that were carried by Barack Obama in 2012. Moreover, only four seats held by Democrats appear to be in districts that Romney carried by at least 10 points and only two seats held by Republicans appear to be in districts that Obama carried by at least 10 points. These results indicate that neither party will have a large number of House seats at risk in 2014. Barring the emergence of a major national issue that results in a substantial advantage for one party or the other on the generic ballot, the seat swing in the 2014 House elections is likely to be fairly small. Nevertheless, the pattern of out-party gains in midterm elections is strong enough that, like Newt Gingrich in 1998, John Boehner may find his speakership in jeopardy if Democrats make even modest gains in the House elections. *The generic ballot is a poll question asking whether respondents would vote for the Democratic or Republican House candidate in their own district without providing the names of the candidates. For the purpose of estimating the forecasting model, I used generic ballot results from the Gallup Poll, which has been asking this question in midterm elections since 1946.